Dear Jim, Your postcard arrived today. I showed it to the family. Mum misses you... Between December 1914 and August 1915 Tom and Jim write to each other whenever they get a chance. Tom talks about life at home on the farm while Jim writes from Egypt and then from the trenches of... read full description below. Dear Jim, Your postcard arrived today. I showed it to the family. Mum misses you... 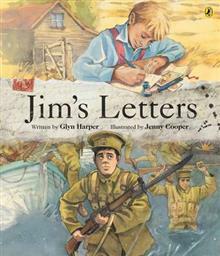 Between December 1914 and August 1915 Tom and Jim write to each other whenever they get a chance. Tom talks about life at home on the farm while Jim writes from Egypt and then from the trenches of the Gallipoli peninsula. From the author and illustrator of Le Quesnoy comes a moving story of two brothers separated by war. It is based on the thousands of letters sent by and to Anzac soldiers fighting at Gallipoli, one of the most significant campaigns of the First World War. This beautiful hardback depicts life at war and on the home front with exquisite illustrations by Jenny Cooper and fold-out letter inserts. Glyn Harper is Professor of War Studies at Massey University in Palmerston North and General Editor of the Centenary History of New Zealand and the First World War. A former teacher, he joined the Australian Army in 1988 and after eight years transferred to the New Zealand Army, where he rose to the rank of lieutenant colonel. Glyn was the army's official historian for the deployment to East Timor and is the author of numerous history books which include Kippenberger: An Inspired New Zealand Commander; In the Face of the Enemy: The complete history of the Victoria Cross and New Zealand; Dark Journey: Three Key Battles of the Western Front; Images of War: World War One: A Photographic Record of New Zealanders at War 1914-1918 and his most recent Letters from Gallipoli: New Zealand Soldiers Write Home. He has written a number of children's books, of which Le Quesnoy and Jim's Letters are the most recently published. Jenny Cooper is a prolific illustrator of children's books. She has been a full-time freelance illustrator for the last fifteen years and has twice been nominated for the Russell Clark Award for illustration. She lives in Christchurch.